Interview with José María Mellado, by José Francisco Góngora for Digital Indalofoto. Indalofoto is a partnership of amateur and professional photographers from Almería (Spain). 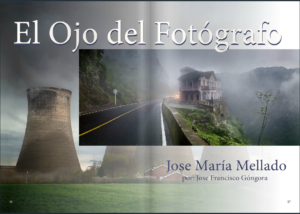 With the report ‘El ojo del Fotógrafo’ (‘The Photographer’s eye’), the magazine pays tribute to Mellado, who took part in this photograhic group before moving to Madrid.